and a non-servicemember's relation to a servicemember. Will Johnson (1889-1942) (line 149) is listed with his serial number 3993015 and rank of Private. His next of kin is his wife. The ship, the USS Orizaba, departed from Hoboken, New Jersey for France in early September 1918. Will Johnson was born on July 6, 1889 in Wilmington, North Carolina, but he eventually moved to Georgia. Before the war, he married his wife, Hattie Hokes. They lived together in McIntyre, Georgia. After registering for the draft, Johnson was inducted into the Army at Camp Gordon, near Atlanta, on July 17, 1918. He joined the 15th Depot Brigade. On August 29, 1918, however, he became part of Company D of the 315th Labor Battalion. The unit boarded the USS Orizaba on September 4, 1918 to depart for France. As the unit name might imply, they served in a service capacity while overseas. Johnson and his unit remained in France until the war ended and beyond, finally leaving on July 7, 1919 from St. Nazaire. The Army discharged Johnson on July 29, 1919. Little is known about his life after the war. He died on September 17, 1942, and is buried in the St. Augustine National Cemetery at Plot D, Grave 11. Record Group Number 92, Roll or Box Number 520. Originally created and published by the Office of the Quartermaster General. 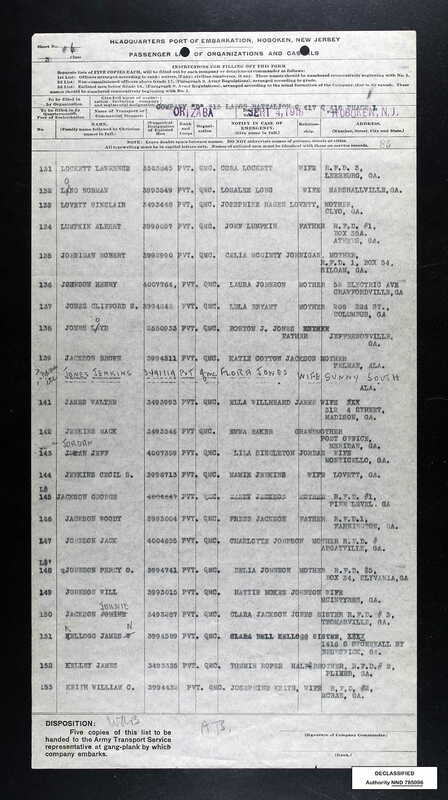 "U.S. Army Transport Service Passenger Lists, 1910-1919." Online database with images, Ancestry.com. Accessed June 25, 2018. https://search.ancestry.com/search/db.aspx?dbid=61174. Office of the Quartermaster General. 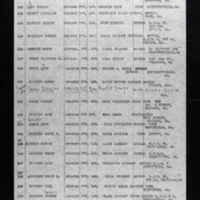 “Passenger List, 1918.” RICHES of Central Florida accessed April 21, 2019, https://richesmi.cah.ucf.edu/omeka/items/show/10371.